Home to world's seven heritage sites such as Galle, Kandy, Sigiriya, Anuradhapura, Polonnaruva, Dambuka cave temple and Lion Singhunraja. 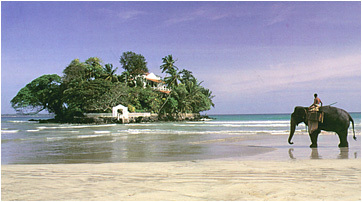 National parks and sun kissed beaches are popular visitor's destinations. Country of spotless beauty, rich legacy, exciting thrills, superb wildlife, blissful aura and charming festivals. Colombo the economical capital city placed with fascinated locations such as dehiwala zoo, Dutch Period Museum, Fort Clock Tower. Political capital city of Pearl in Indian Ocean is Sri Jayewardenepura Kotte which is commercially as well as naturally secure for various destinations depicting colors of Sri Lanka. Language: Sinhala (official and national language) 74%, Tamil (official and national language) 18%, other 8% . Electricity: 230V/50Hz (British BS 1363 type plug is most common with fewer (older) installations of BS 546, the circular plug used in India, being present).